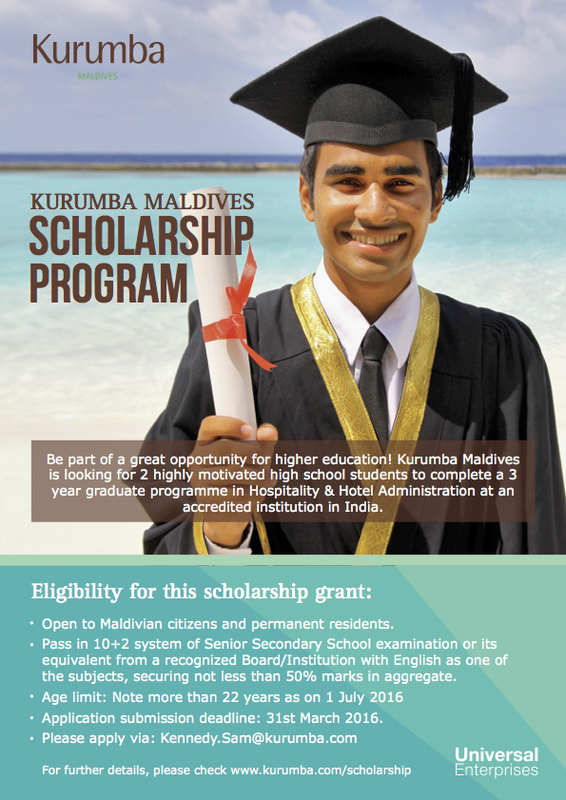 Kurumba Maldives has established a scholarship programme to assist Maldivians who plan to continue their education in college. Under this programme, Kurumba provides scholarship grants to two graduated high school students, to enable the recipients to complete a 3 year graduate programme in Hospitality & Hotel Administration at an accredited institution of the resort’s choice in India. This scholarship is eligible to Maldivian citizens and permanent residents who have passed in 10+2 system of Senior Secondary School examination or its equivalent from a recognized Institution with English as one of the subjects, securing not less than 50% marks in aggregate. Those appearing in qualifying exam can also apply on provisional basis. Provisional admission will be cancelled on non-submission of having passed the qualifying examination at the time of admission or latest by 30th September 2016. Graduates with challenging life conditions and with a higher level of aptitude and attitude will be preferred. Age limit: Not more than 22 years as of 1st July 2016. Application submission deadline: 31st March 2016.